Last weekend we drove north up to Inverness so that Jack could watch his beloved Dumbarton FC playing against Inverness Caledonian Thistle. Don’t ask – it was a disaster! A quick trip to Dingwall, a small town north of Inverness resulted in us discovering TWO second-hand book-shops there. I was flabbergasted and left wondering if the long hard winters up in the Highlands mean that there are a lot of keen readers around the area. 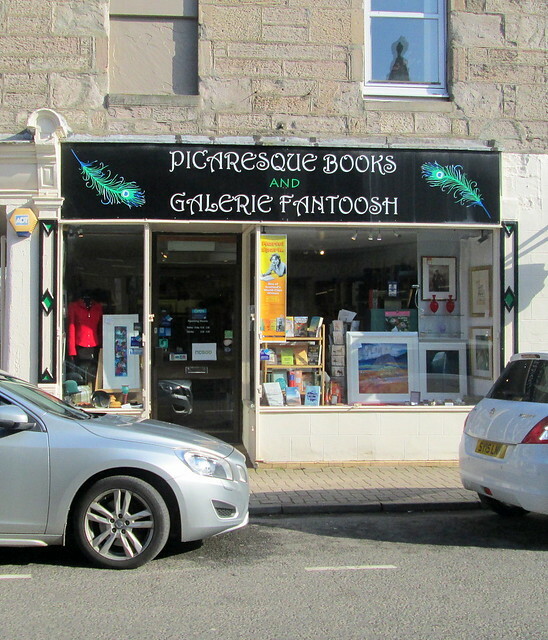 One of the shops has the wonderful name of Picaresque Books and Galerie Fantoosh as you can see from the photo. (Fantoosh is a Scottish word meaning overly fancy.) The shop is a mixture of old books and works of art in the shape of paintings, pottery and jewellery – it’s a lovely shop with very friendly owners. I came home feeling slightly disappointed by my haul, which I think you’ll agree must mean that I’m getting positively greedy in my old age! Today it was actually quite mild and sunny – at times anyway and I spent most of the day in the garden , still ‘redding up’ (tidying up) weeding and cutting back the dead bits. In fact after the brutal cold weather and snow we had a fortnight ago there are now quite a few fatalities. My rosemary bushes had gone all through the winter fairly happily, but the Easter weather was just too much for them and they’ve had to be chopped right back, I hope they re-grow. It was only today that I realised that my lovely ceanothus (Californian lilac) now has brown leaves instead of the lovely glossy dark green leaves it has had all through the winter. More chopping back required, I find it painful. A few roses have succumbed to the cold weather, but I’m hopeful that they might survive – eventually. Strangely the lavender bushes are all very happy looking, so much for them being tender Mediterranean plants, but my Alpine edelweiss plant looks like it has had it. I’ll leave it in though just in case there’s life in the roots yet. Over the weekend we were up north in Inverness on a football related jaunt. Friday was freezing and grey, a disappointment as the weather forecast said it would be nice up there. But the sun arrived on Saturday – and there was warmth with it, amazing! When I say warmth it was probably just in double figures celsius, but not long ago it was -5 so I was happy. Can you believe I actually had to put the car window down? Inverness was heaving with people, there were so many tourists, and it being a Friday night we couldn’t get into any of the restaurants that we tried as we hadn’t booked. There was one restaurant that had only four people in it, not a good sign considering how jam packed everywhere else was, but we had no alternative so we gave it a go. It was a Mediterranean eatery (allegedly). It was expensive and it was possibly the worst meal I’ve ever had in a restaurant – AND I came out feeling hungrier than I had been when I went in! Why oh why didn’t I check out the Tripadvisor reviews first?! The book pile has grown by seven books, I bought some in the Pitlochry bookshops on the way up to Inverness. Then some more in a Dingwall bookshop. Dingwall actually has two secondhand bookshops, amazing. I think maybe the long dark winters in the Scottish Highlands lead to a lot of people picking up books to take themselves to pastures new, for a wee while anyway. 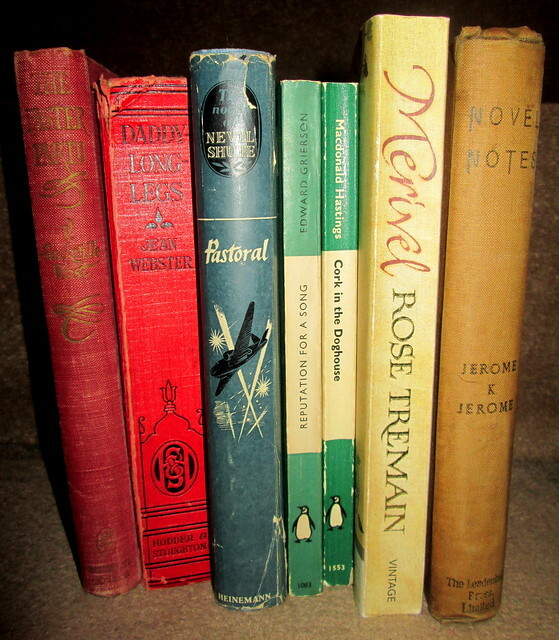 One of the books that I bought was by Rose Tremain. I’ve never read anything by her, but I enjoyed reading this Guardian article last week. Have you read any of her books? I didn’t take any photos of Inverness itself, but you can see some images here. As usual I had planned to schedule a few blogposts for when we were away in Fort William and Inverness, but I was so busy beforehand that I never did get around to it, so it has been unnaturally quiet on ‘Pining’ this last week. For good reason though, as you might know Peggy of Peggy Ann’s Post is staying with me this month and we were joined on our Highland sojourn by Evee of Evee’s Blog and of course Jack was with us – he was our driver! I worried about the weather as Fort William is infamous for being wet and of course it was wet when we got there but the drive up until then had been mainly dry, if a bit grey. We were there just last June and had great weather just a few miles north of Fort William so managed to take some lovely photos of the Spean Bridge area, sadly the weather this time was grey and very windy – when is our summer going to arrive? Anyway if you don’t know what the Spean Bridge area looks like you can see lots of images of it here. So we didn’t hang about there long this time. When we arrived at Fort William it was chucking it down with rain and we made for the bookshop which Jack and I had been lucky to buy some books in last year. The shop owner was just about ready to close it but within less than 5 minutes – I, Peggy and Evee had managed to find books which we had been looking for. I was chuffed to find the third book in the McFlannel series by Helen W Pryde and I also bought a book about Hugh Lofting the writer of the childrens series, Dr Dolittle. Peggy got a whole load of books by and about O. Douglas (Anna Buchan) and Evee bought a couple of books by Maurice Walsh which she had read back in the year dot and wished to revisit. Now she has me thinking that I should read his books too, as if I don’t have enough books already in my piles! Anyway, it turned out that it was just as well that we bought books in Fort William as the famous bookshop Leakeys in Inverness turned out to be a big disappointment for us, although Evee did manage to buy a few books. I would say that all of the books there are vastly overpriced, a lot of them aren’t in alphabetical order – come on – pull your socks up, it’s a nightmare if books aren’t in some sort of order, I was tempted to start sorting them out myself. It’s always the way of it, much longed for trips to ‘special’ bookshops always end up being a damp squib for me, then I find treasures in the most unexpected places. Oh well, it all adds to the spice of life I suppose.